It’s been a while since I’ve read an anthology that I haven’t been a part of, so when the psychotic nutjob social media coordinator and anthology editor Nick Sharps over at Ragnarok Publications asked if I would be interested in reviewing a book featuring kaiju (Japanese for “strange creature”) and fresh off my complete enjoyment of Pacific Rim, I enthusiastically agreed. I was not disappointed. 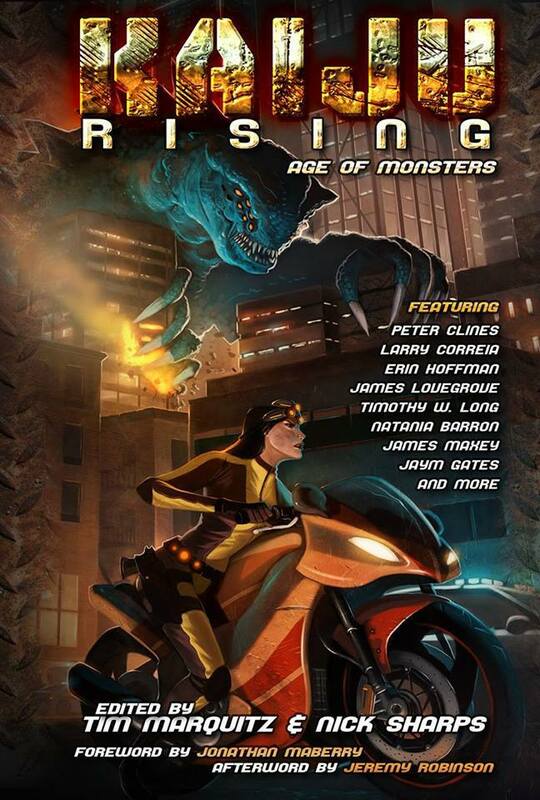 Kaiju Rising: Age of Monsters was, overall, simply amazing. Instead of an overall review, however, I’m going to review each story individually, so that each author can be featured and their story dissected and given the proper space for the review. Edited by the aforementioned Nick and Tim Marquitz, it is a collection of tales that should satisfy every type of kaiju lover. Big Ben and the End of the Pier Show (James Lovegrove) starts off the anthology, and is a story about a man who was stuck with a part of his family’s legacy that was driving him under: a tourist pier that his grandfather had built. He contemplates selling it, as well as burning it down. But just as he’s about to, he hears word that a kaiju nicknamed “Red Devil” is slowly making his way up the English Channel. The U.K.’s response? Big Ben, the lone fighting machine that is the only thing left that can potentially fight the kaiju head-on. A good, solid start with plenty of action, Lovegrove sets the bar fairly high for all the writers to follow. The Conversion (David Annandale) is up next, and his story about the Eschaton, the Jewish “End of Days”, the name for the kaiju which is intent on destroying Manchester and the characters believe that faith can turn back the monster. Family conflicts abound here, but the primary story (faith vs kaiju) is a bit overshadowed by the slow build up. A decent enough story, though not one of my favorites. However, the ending of the little story more than makes up for the slow start and leaves the reader with a satisfied conclusion. Day of the Demigods (Peter Stenson) was a humorous tale (for me, anyway) from the point of view from an actual kaiju who was struggling to make it in his own society. Rejected by his cousin/crush (I’m sure kaiju mating options can be limited at the best of times), Sweetgrass is determined to make it big in Hollywood, so he stomps into the city to audition for the studio execs at various production companies. Unfortunately, he can’t really talk to him, because his voice is so loud it blows out their eardrums when he tries to communicate. Mass panic ensues, and some hilarity as well, since Sweetgrass isn’t the smartest kaiju out there. A very well written story, and an interesting perspective as well. The Lighthouse Keeper of Kurohaka Island (Kane Gilmour) is next and, quite frankly, is my favorite story in the book. It is the story of Shinobi and his father, who are lighthouse tenders along the many Japanese islands. It is their duty to ensure that all lighthouses and up and running, including the lighthouse on an island which is not mentioned on their maps but Shinobi’s father seems to know where it is located: Kurohaka Island. There, Shinobi is shocked t ofind many bones of enormous monsters and his father tells him that this is where the kaiju come to die. When Shinobi presses for more info, his father tells him the story of their family and how the firstborn boys always have the sight to see monsters, which includes fascinating stories about his grandfather who was at both Hiroshima and Nagasaki, which was the site of two kaiju battles and not nuclear explosions like everyone thought. This story is a sad and powerful one, and as I said before, my favorite. Occupied (Natania Barron) was a confusing story about a woman and a kaiju who share a strange connection. A disjointed tale which seems to revolve around a magic pair of scissors and the descendant of the creatures who fell from the heavens eons before, it could be argued that the tunnels the woman featured in it represent her mind, but I’m not entirely sure that one was correct. After such a powerful story previously, this one was a bit of a letdown. I think it would have been better served elsewhere in the book. One Last Round (Nathan Black) starts off differently, with a movie being filmed about the KRASER, a kaiju response machine and the… superhero(?) Colonel Ausum defending New Orleans against the kaiju Akoni, the devil of Tokyo. After the end of the scene, the star of the film discovers that the films about the KRASERs were being stopped, which would mean an end to the kaiju-fighting robots, since they rely on the movie proceeds to fund them. However, as the set is closed down and the KRASER is being removed, the kaiju alligator Grimmgarl attacks New Orleans, and it’s up to the KRASER team and Colonel Ausum to stop it before it “does what Mother Nature failed to do: level New Orleans.” A good, fun story. The Serpent’s Heart (Howard Andrew Jones) is another good story, featuring a group of men who serve the Caliph and are drifting in the middle of the ocean after being attacked by a sea monster. They are rescued by a mysterious ship captained by an exotic, dangerous woman, and not all is as it appears. This is one of those stories that I can’t go too much into detail without spoiling it, so I’ll just give this one a positive grade and hope you enjoy it as much as I did. Monstruo (Mike MacLean) is about a kaiju about to hit Playa de los Muertos (fitting name for the beach, actually) and tells the story about how the kaiju are drawn to a selected “person” who had been marked by one of their scout bugs on the planet. In this case, it is a little boy. Task Force M operatives are scattered around the globe to eliminate the person “targeted” by the infiltrators, but unfortunately the hero of the story can’t bring himself to kill a little boy and the devastating effect his decision has on Mexico City. A good story, worth a second read once you get to the end and everything makes more sense. 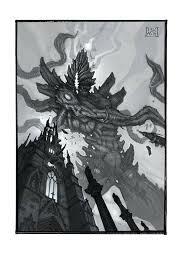 The Behemoth (Jonathan Wood) is the story of a mech pilot who is the best at beating the kaiju when they attack. However, he risks losing everything when he discovers that his wife is chosen to be a Proxy — a person who runs the interface between the Mech and the pilot, buffering the pilot from the circuitry at the cost of all of the Proxy’s memories. The story takes the reader back through time and shows the mess that the pilot, who was once idealistic and fighting for the people, becomes as time wears on. The pilot has a plan to save his wife, however, though the cost could be too high for everyone involved. Great, great story here, and I really like how the author delves into the psyche of a warrior who has seen too much, been given too much power and how it can twist any man. 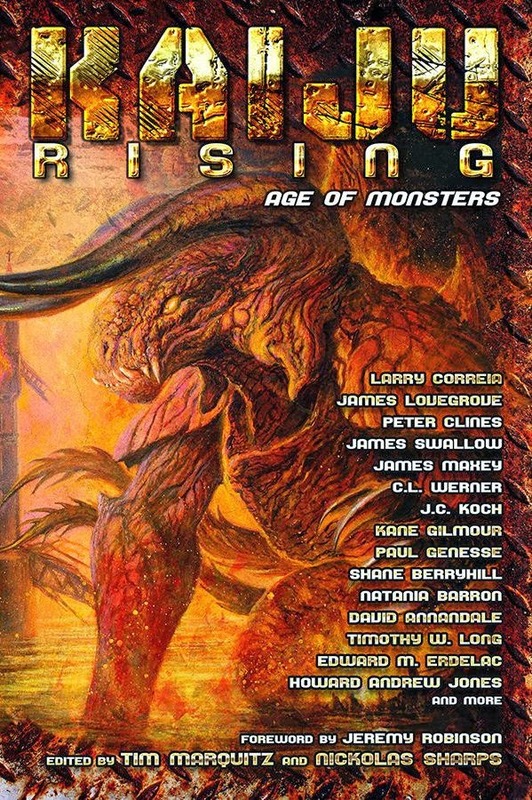 The Greatest Hunger (Jaym Gates) is another powerful story about a kaiju named Derecho and her handler, a woman with psychic powers who is a slave to the owner of the kaiju. She tries to keep derecho alive and motivated to fight in the arena, hoping to simply keep her friend alive. She devises a plan to save both her and Derecho, and exact their revenge upon their masters at the same time. Great story, if a little slow at first, but with a solid conclusion. The author has a great voice and would love to see more from them. Heartland (Shane Berryhill) is a story I really didn’t care too much for. It was less kaiju and more virginal sacrificing, which is interesting but oddly placed in the book. Our protagonist must save her daughter before she is to be sacrificed by the elders of the city. It almost reads like a battered wife story, with a heavy-handed approach that comes off a bit awkward. Perhaps it’s the subject matter that turned me off from this story, but even the ending left me completely unsatisfied. Though I will again add that perhaps it’s just me, and others may like the twist at the end. I think it’s too Shyamalanian. Devil’s Cap Brawl (Edward M. Erdelac) is a story of a shaolin monk and a kaiju which is accidentally awoken during the building of a railroad line through the mountains sometime during the late 19th century. Joe Blas was a rough man who was trying to meet his quota and build the railroad line, but his superstitious workers (mainly Chinese and Indian) slow progress down when they believe that they will awaken a great monster in the mountain. A slow starting story, it builds nicely as the reveal of the shaolin monk is made and the kaiju appears. Good story, if, as mentioned before, a bit slow to start. Shaktarra (Sean Sherman) is a story about a powerful kaiju which is released onto unsuspecting Las Vegas, and a dimensional shift occurs and drags people into a dense jungle where the lizardmen worship the kaiju as a god. A decent story that was heavy on action but light on just about everything else, it’s an okay story that is supported primarily by the idea (wishful thinking on my part) of destroying Las Vegas. Of the Earth, of the Sky, of the Sea (Patrick M. Tracy and Paul Genesse) is a story which takes place in shogunate Japan and stars three slumbering kaiju who were, in ancient times, protectors of Japan. They are left to slumber, however, as their destructive capabilities almost outweighs their usefulness. This comes to an end, however, as gaijin (the British) arrive and begin to demand that Japan open their ports to trade. Using their ironclad ships and destroying everything in their way, the Japanese grow desperate and summon their kaiju to protect them — but at a terrible price. A great story, this is another one of my favorites in the book and has everything a reader could want — action, story, romance and loss. Good, good story here. The Flight of the Red Monsters (Bonnie Jo Stufflebeam) is a story which was wrongly named. I got the impression throughout that it should have been “Fall Into Shadow”, which would have suited the story much better. The story is about revenge on both sides, as the red monsters who live in the oceans are pissed about their homes being polluted by humanity and the heroine of the story out for vengeance against the red monsters for killing her fiance. She loses herself in her quest for vengeance, and joins a shadowy group of people who are fighting back against the kaiju. A good story, though a bit confusing between the point of view shifts (those keep you on your toes), though it had another one of those twist endings. At this point of the anthology, however, I’ve started expecting them. Operation Starfish (Peter Rawlik) is a story set just after World War Two, when nuclear “testing” is occurring in the South Pacific. The Russians, British and Americans have secretly teamed up to use their nuclear bombs to destroy kaiju as they appear from beneath the waves of the Pacific. The story is pretty good, though with a bit of “what the hell?” scattered within (the USS Miskatonic made me chuckle, however), it was a little confusing towards the end. Still, pretty good overall. With Bright Shining Faces (J.C. Koch) was just weird. It tells the tale of a little girl who draws monsters, but the monsters aren’t there to hurt her classmates or her teacher. The teacher is mildly concerned about her student’s ability to start to take over the class, but doesn’t worry about it too much. Eventually it turns into a horror story straight out of Arkham as everyone begins to turn into nightmarish creatures. As I said, the best way to describe this one was “weird”. The Banner of the Bent Cross (Peter Clines) was a fascinating look at ancient Greek myths, where kaiju have been hiding right beneath our noses. When the legendary Argo is discovered by Nazi Germany, it is put into action against the allied forces. Desperate, the allies seek out historians who may be able to help. Their come up with a suggestion: awakening the sisters Scylla and Charybdis, who have a hatred towards Jason and the Argonauts and desperately want revenge. Their plan works, but with disastrous results. A good story by the author, it’s possibly the most original one in the entire bunch, as it touches on something nobody has ever thought of before: kaiju have been mentioned since the time of the Greeks, just in a different form. Fall of Babylon (James Maxey) is another brilliant story about the End of Days, though this one is kind of twisted. The Lamb of God is marching into New York City, and the only person who can stop it is a washed-up teen pop star. My confidence in her saving the day, obviously, was not too high. Nonetheless, the author creates enough twists and turns to make it work, culminating in a fight between the pop star, her brother, a fallen angel, the great dragon and the Lamb. Great, fun story here. Dead Men’s Bones (Josh Reynolds) is kind of mash-up of zombies and kaiju set in World War One. It’s almost kind of mystical story, though it does have some interesting characters, I think the author hit the shock factor a bit too hard. It was more of a tell and less of a show, though it did have parts in it that were okay. It was decent enough, but personally not my thing. Other may like it, however. Stormrise (Erin Hoffman) is a story I tried to read, but couldn’t get into it. I tried, but it didn’t grab me. I can’t really review this one. Big Dog (Timothy W. Long) is a story about Big Dog, a kaiju fighting machine built just after the fighting in World War Two ended. Crewed by a mixture of German, American and British, the Big Dog is tasked at defeating the massive kaiju that the Japanese Empire are sending out to destroy the rest of the world. With some internal tension among the crew of the Big Dog (the German is a former tank commander, the pilot’s husband was killed by a German tanker) it’s a good story with some solid meat to it. I enjoyed this one quite a bit. The Great Sea Beast (Larry Correia) is the story of Munetaka and his encounter with the great sea beast. Discovered half-dead and poisoned by the son, his recollection of the events which led to the death of his father and many sailors of the Minamoto clan is discounted and he is ridiculed. He becomes a brilliant archer, however, and eventually begins to hunt the great sea beast himself. It’s a solid story with a very realistic portrayal of feudal Japan. Animikii vs. Mishipeshu (C.L. Werner) is a story about two Native American kaiju who battle after one of awaken during a copper mining expedition in Canada. This was pretty good overall, though I kept picturing the Plains Indian Thunder God in place of one of the kaiju. A separation between the two could have really helped, or perhaps fully delving into that mythology might have. Still, fun story, and the only one to really take a look at Native American mythology. The Turn of the Card (James Swallow) wraps up the book, and is a story about a kaiju which takes on London (the United Kingdom seems to be the target of choice for the kaiju in this book). In the midst of a city-wide evacuation, India 99, a helicopter crew, is trying to get a relative out before the kaiju who are fighting among themselves destroy the entire city. Packed with plenty of action and suspense, this story was near the top of my list as well, though not for obvious reason. The dialogue, something I usually don’t comment upon, was absolutely perfect for the characters, breathing a life into them that prevented the story from flopping. It’s a pretty satisfying conclusion to the entire book. Overall, the book was very good. Most of the stories weaved seamlessly between each other and I was generally pleased with the stories. A must-buy for anyone looking for some kaiju-related books, or anyone looking for a fun, entertaining read. No link yet for those looking to purchase, but keep an eye out at Amazon for the book to premier. This entry was posted on February 6, 2014, 4:00 pm and is filed under Book Review. You can follow any responses to this entry through RSS 2.0. You can leave a response, or trackback from your own site.